Click here to discover other bus routes in the North West. Bowness on Lake Windermere, England's largest, is an easily accessible delight. Things to do include a cruise on the lake, from the pier where the 599 termintates. If you'd rather not venture out onto the water, how about Blackwell Arts & Craft House? 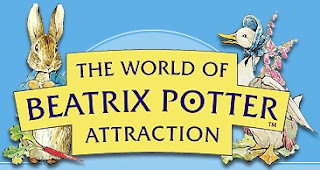 Or if visiting with the kids, you could do worse than take them to the World of Beatrix Potter. Windermere the town is a short distance away from Windermere the lake. It was originally called Birthwaite until the railway arrived and the station took the name of the lake in order to entice tourists in. Soon after, the town followed suit. If arriving by train, this is your gateway to the Lake District. As pretty as the town is, there's so much more to see, so don't hang about here. The 599 stops right outside the railway station, next to the Booths supermarket. The railway station entrance, bus stop and supermarket entrance are round the back of Booths. I can't think of a classier supermarket to wait behind. After riding alongside the lake for a bit, the 599 brings us to the beautiful village of Ambleside. While here, why not stop for a pint at the Golden Rule, one of the best pubs in the village? You've not got to drive back, after all. If you fancy a stroll up to a waterfall, head for nearby Stock Ghyll Force. Ambleside is of course a great base for longer walks, many books of which are available. This is the southbound stop. Northbound buses stop at the lay-by opposite. A bit further on, the 599 terminates at Grasmere, another great starting point for a hike. Here you'll find St Oswald's Church, in the churchyard of which you can find the tomb of William and Mary Wordsworth. Another of his homes, Dove Cottage, is nearby, as is the Grasmere & Wordsworth Museum. See the full timetable on Stagecoach's website here. Map of the 599 and connecting routes. Not to scale. All routes on this map are operated by Stagecoach and are valid for travel with a North West Explorer ticket. 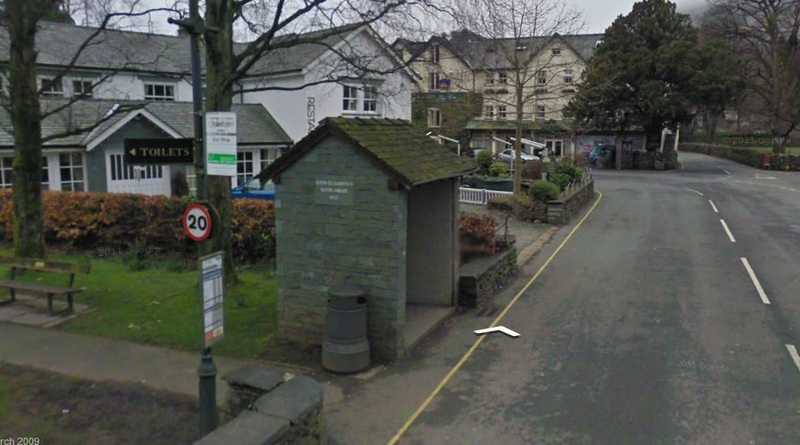 See a map of all Stagecoach routes in the Lake District here. For all routes of all operators in the whole of Cumbria, look here. Timetables for all buses in Cumbria can be found here. 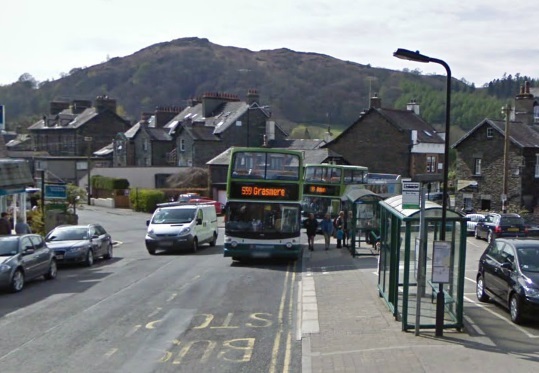 From Bowness, connect with Stagecoach 6 to Barrow-in-Furness. 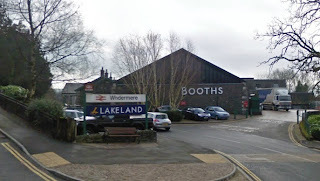 At Windermere railway station, there is a regular rail service to Oxenholme Lake District on the West Coast Main Line, plus a few through trains per day to Manchester Piccadilly and Manchester Airport. Click for timetable, live departures, departure list, fares. Also from Windermere station, you can connect to Stagecoach 555 towards Lancaster via Kendal. At weekends, you can also catch Stagecoach 508 to Penrith via Glenridding and Ullswater. Change at Ambleside for Stagecoach 505 to Coniston or 516 to Dungeon Ghyll in Langdale. 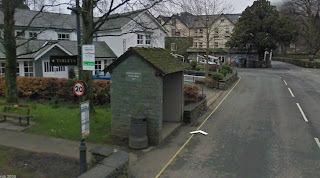 From Grasmere, you can continue north to Keswick on Stagecoach 555. A family ticket is valid for up to 2 adults and 3 children. A group ticket is valid for up to 5 people travelling together. 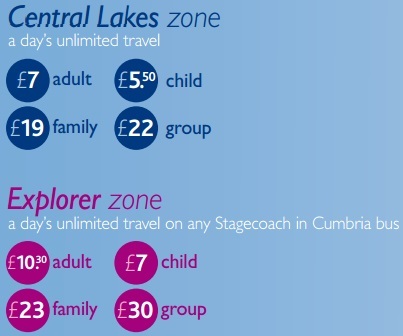 The Explorer ticket at £10.30 is valid over a wider area: on all Stagecoach buses in Cumbria and Lancashire, plus routes stretching to Bolton, Wigan, Liverpool, Dumfries and Newcastle-upon-Tyne. If arriving at Windermere by train, you can buy a Windermere Plusbus with your train ticket. It is only valid for travel along the 599 route, although you can use other services like the 555 to make the journey, as long as you don't travel beyond where the 599 goes. It costs £7.00 for an adult, but Railcard discounts are available. 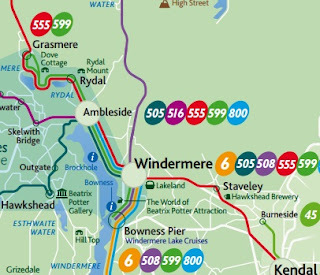 Between Windermere and Grasmere, the 555 runs all year round to the same route as the 599, but not with open top buses. Between Windermere and Ambleside, you also have routes 505 and 516. All bus routes mentioned on this page are operated by Stagecoach.